How quickly praise has changed to insults. A few days before the crowds had shouted “Hosanna”. 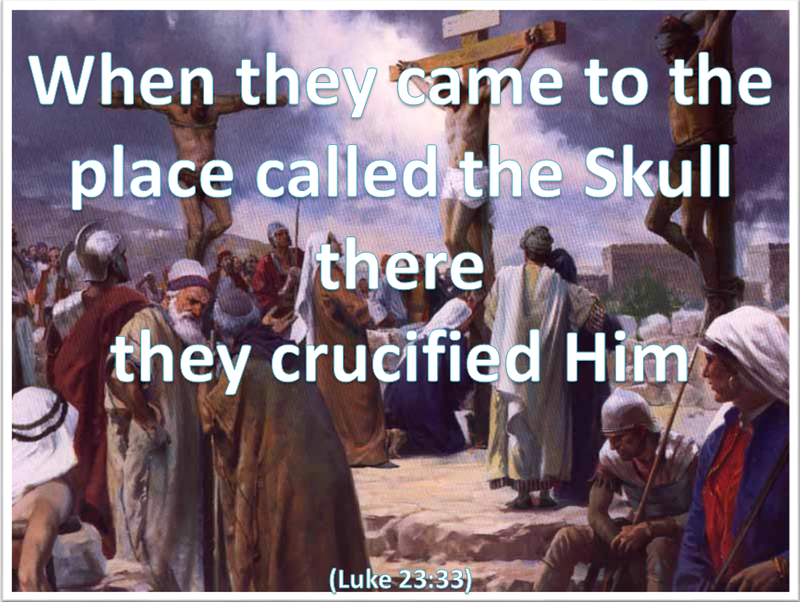 Then it was “Crucify!” Now they threw His words back at Him and ridiculed Him. Notice how similar this challenge is to the one issued by the devil as he began the temptations in the desert. Both challenged Him to prove His identity as the Son of God by performing a miracle. Both challenges were also focussed on His physical need. Both were rejected by the Lord whose vision and purpose where far greater. We all face challenges and temptations in our lives – including those that will establish us as significant in the eyes of others. We would be mortified if we were to lose our reputation and be discarded as worthless – particularly if it happened in such a public and humiliating way. Jesus suffered this as a part of His sacrifice of Himself on our behalf. There was no glory involved at the time. Categories: Christianity, Daily Life, God | Tags: Crucifixion, Daily Bread, Faith, Jesus, Lent, Life, Matthew, Perseverance, Scripture | Permalink. woven in one piece from top to bottom. “Let’s not tear it,” they said to one another. Who would have thought that the blood-stained garments of a convicted criminal would have had any value to a Roman soldier. Yet they obviously did. When they came to the undergarment instead of cutting it up with a piece for each of them they drew lots to decide who would get it. John is strangely specific in his description at this point – “This garment was seamless, woven in one piece from top to bottom.” Barclay tells us that “this is the precise description of the linen tunic which the High Priest wore.” So here is a quiet reference to the high priestly ministry of Jesus – the perfect High Priest through whom people could come into the presence of God themselves. 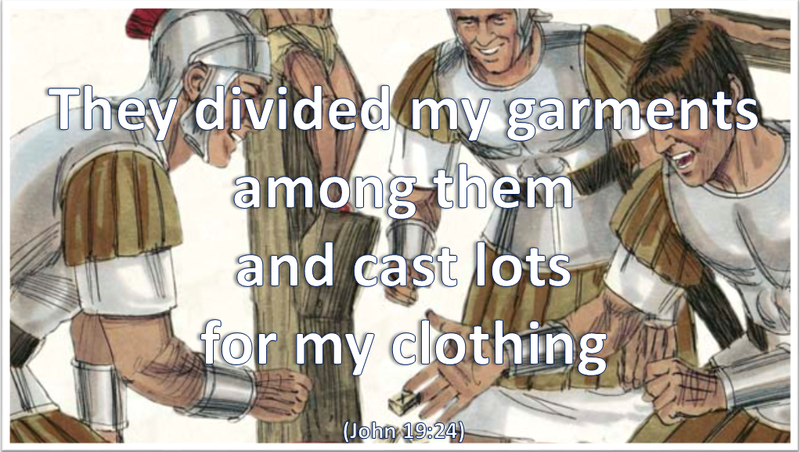 John starts His Gospel with the Word made flesh and draws it to a close with the eternal High Priest ministering to both God and man and enabling them to come together. However, whilst these tremendously important events were taking place above their heads the soldiers were concerned only with their plunder and their gambling. Although they were professional soldiers in a foreign land they still in a way represent to us the indifference that exists in the world today. It bends its heads to the business of accumulation and is blind to the awesome expression of the love and grace of God which rises before us at this time. This whole incident is made all the more pertinent by the value attached to it as a fulfilment of prophecy (Psalm 22:18). In all that was happening God’s hand can be discerned – even down to the disposal of the Saviour’s clothes. Categories: Christianity, Daily Life, God | Tags: Cross, Daily Bread, Faith, Jesus, John, Lent, Priorities, Scripture | Permalink. One of the greatest blessings of medical research is the advancement made in the area of pain-killers. Having had a number of surgical procedures in the last two years I have been made very aware of the benefits of being unconscious during the operations and relieved of pain after them. Jesus did not have that blessing. 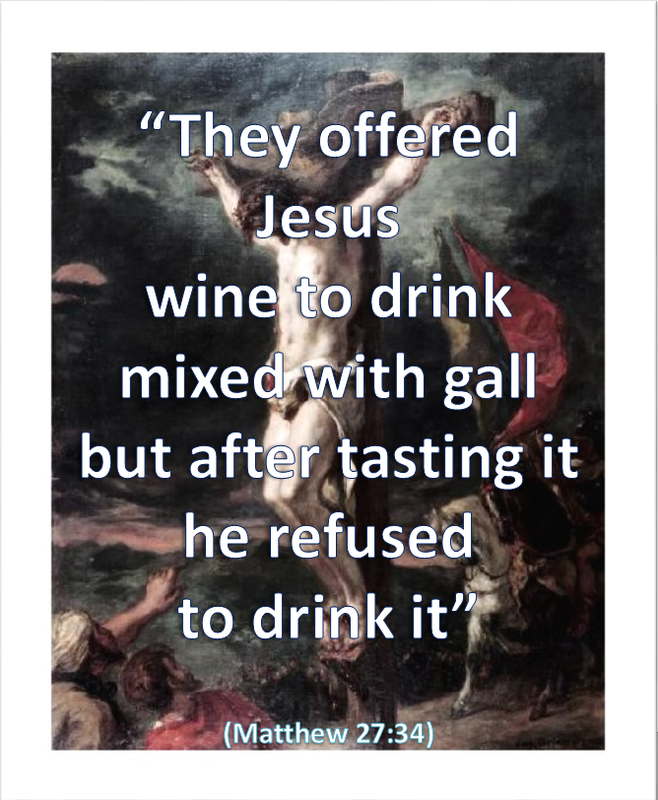 In fact He refused the best that was on offer – the wine mixed with gall. William Barclay tells us that this drug was made-up by a group of wealthy women in Jerusalem as an act of mercy. It was a way of deadening the senses. 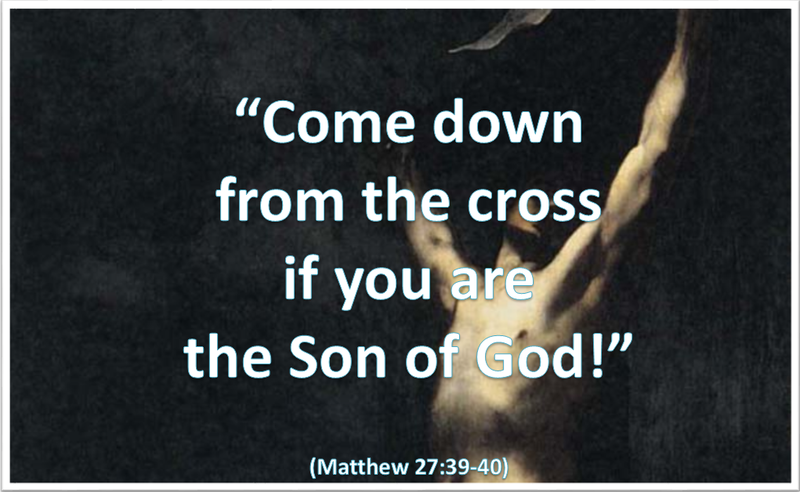 However, Jesus was not going to pass through His hours on the cross in a drugged state of semi-consciousness. In dying there for our sins ‘He was determined to accept the suffering and death at its bitterest and at its grimmest and to avoid no particle of pain.’ His calling was to be a living sacrifice and not a senseless offering. So He suffered in our place the punishment and death that we deserved. We cannot begin to imagine the searing pain in every part of His body over those long hours, and the spiritual torment that He suffered in the process. But He hung there and accepted and absorbed it for every moment of my life and living – the past, the present and the future – and for the eternity that was His to offer. Categories: Christianity, Daily Life, God | Tags: Crucifixion, Faith, Jesus, Lent, Life, Love, Matthew, Obedience, Perseverance | Permalink. There was only one person there who knew the truth of what was happening – and that was Jesus Himself. There were others who should have known, but they either could not or would not acknowledge the truth. How could they have stood there and acknowledged that this man on the cross before them – whom many had had a hand in putting there – was in fact the eternal Son of God and the long-awaited Messiah? 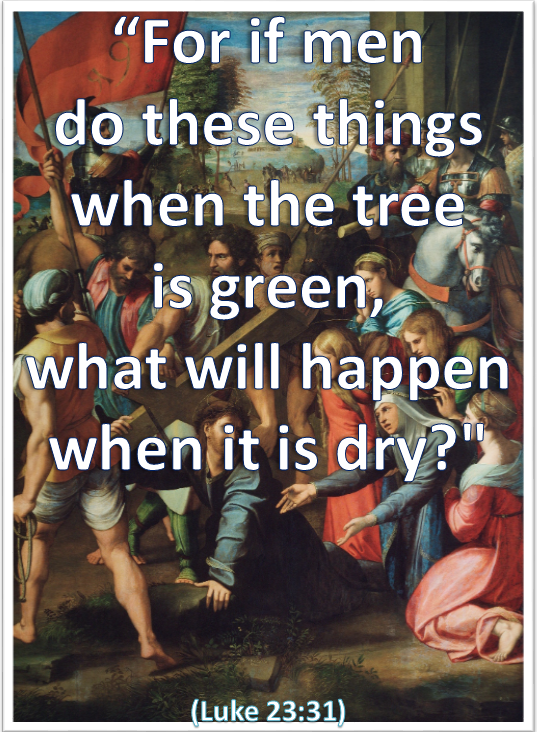 Yet Jesus had warned them in His parable of the Tenants. Then there were the others –the crowd, the soldiers, even His family and disciples – who were not fully aware of what was happening in front of them. And so it fell to Jesus to say something into the situation, and His words are remarkable. No anger at the blindness and callousness of the authority figures, no rebuke for the fickleness of the crowds, no startling miracle or revelation to humiliate His accusers – just these simple words coming as a desperate appeal from His breaking heart of love. 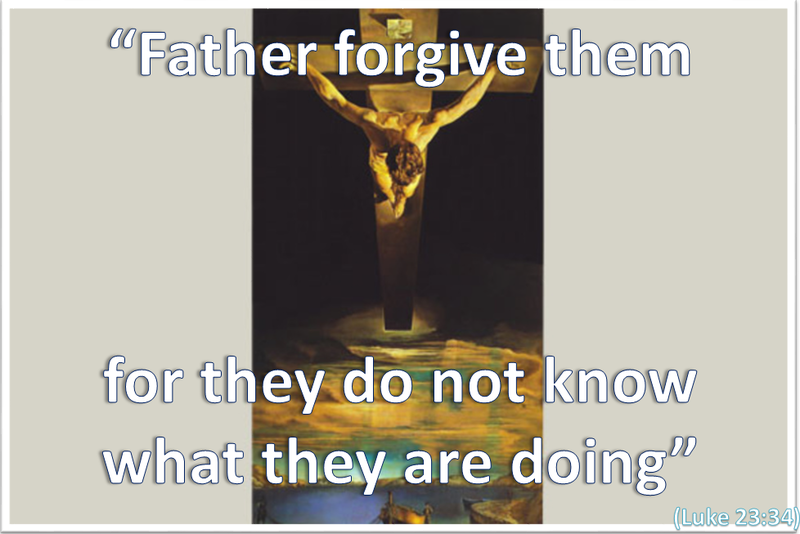 He asked His Father to forgive them just as He obviously already had. And none of us really know what it is that we do when we sin – when we choose ourselves above Him – when we choose our way instead of His – when we choose our pleasure and security over His will and trust in Him. How truly blessed we are. Categories: Christianity, Daily Life, God | Tags: Daily Bread, Forgiveness, Jesus, Lent, Life, Love, Luke, Prayer, Scripture | Permalink. Finally Jesus had arrived. Since before the creation of the world this was the place towards which His redeeming ministry had been pointed. However there were no laurel wreath and great acclaim awaiting Him. There were no crowds to cheer Him on like a long-distance runner finally entering the stadium for one last and glorious lap. Peter Marshall envisioned it like this. a hill shaped like a skull, outside the city gates. Even the hardest of them were silenced. she could not bear the thud of the hammer. and lifted it slowly off the ground. in the wrists of the Nazarene. dropped into the hole prepared for it. Categories: Christianity, Daily Life, God | Tags: Daily Bread, Jesus, Lent, Life, Love, Luke, Obedience, Scripture | Permalink. And so they placed the cross on Jesus shoulders and led Him staggering towards the place of execution. On the way they met Simon of Cyrene and, because the weight of the cross was almost too much for the Lord, they made him carry it for Him. Simon might not have been too happy at the time but afterwards may have counted it his greatest privilege. A large number of people followed this grim and slow procession including ‘women who mourned and wailed for Him.’ These must have included those who had followed Him in His ministry and helped to support Him and His disciples. There would have been Mary His mother as well as Mary Magdalen and possibly the sisters Martha and Mary. With them could have been many of the women of the city as well. At one point Jesus turned to them and gave a prophetic warning of the terrible times to come – times so bad that the women without children to suffer would be counted the more fortunate. And then He gave a final warning. If men to these things even to Him whilst He is in their midst what shocking things may they do when He is gone. Indeed we can see it in ourselves. There are things we would never contemplate whilst in church on Sundays. However from Monday to Friday they may well become a part of our lives and living. Categories: Christianity, Daily Life, God | Tags: Daily Bread, Faith, Jesus, Lent, Life, Love, Luke, Obedience, Scripture | Permalink. “Then he released Barabbas to them. 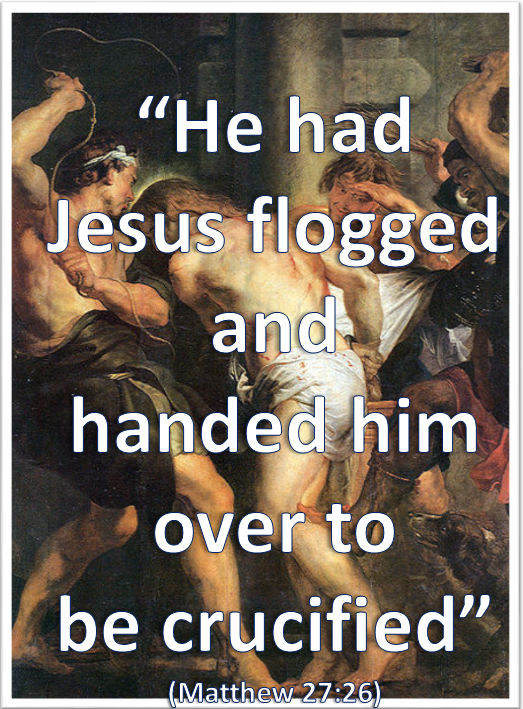 But he had Jesus flogged, and handed him over to be crucified. Then the governor’s soldiers took Jesus into the Praetorium and gathered the whole company of soldiers around him. They stripped him and put a scarlet robe on him, and then twisted together a crown of thorns and set it on his head. They put a staff in his right hand and knelt in front of him and mocked him. “Hail, king of the Jews!” they said. They spit on him, and took the staff and struck him on the head again and again. After they had mocked him, they took off the robe and put his own clothes on him. Pilate now called for water and washed his hands in front of the crowd whilst saying that he was ‘innocent of this man’s blood.’ In this way he finally gave in to their requests. However, much as he might want it to, the water could not cleanse him of his responsibility for what was to take place. Like Lady Macbeth he would carry his acts into the final judgement still to come. “Here’s the smell of the blood still. will not sweeten this little hand. I well recall saying to myself whilst watching The Passion of the Christ, “That’s enough now Lord, that’s enough blood!” But it was whilst Jesus was still struggling along the road towards Calvary where He had hours more terrible agony in front of Him. He had to live through every long and soul-screaming second – and He did it for me – and for you – and for all of us – because He loves and wants us with Him – so much. Categories: Christianity, Daily Life, God | Tags: Daily Bread, Faith, Jesus, Lent, Life, Love, Matthew, Obedience, Scripture | Permalink.